Following is a collection of newspaper articles, published primarily in the Dallas Morning News over the past 80 years, relating to events, features and stories on South Shore Drive. If you have any additional stories or photographs of the time, please drop us a note and we will be happy to include your material. “Demolition of the dam creating Lake Helen in Beckleywood addition, south Oak Cliff, will be ordered if Public Works Director A.P. Rollins recommends such action, City Councilmen said Friday. 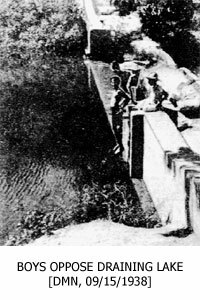 Herman Munster, 132 South Shore Drive, presented a petition for such a step, pointing out that the lake has practically silted up and is no longer desired.” (©Dallas Morning News, September 24, 1938, Section I, Page 6). Like most gardeners, Mr. and Mrs. Henry Garcia wanted two things especially when they planned their home: Privacy and a fine view. And they achieved it very easily, at 226 South Shore Drive. They chose a lot almost an acre in area, in a bit of natural woodland. The home stands in the midst of a grouping of elms, oaks and cedars, some of which were removed to make room for the house and front yard. On one side, the driveway leads to the garage. On the other, there are the trees. A wood slopes down across the road from the front of the house. At the back, a lawn leads to a group of colorful sumacs at the foot of a high cliff. Here is where the view and privacy come in. A large picture window in the living room gives a view of a redwood terrace, with red-colored cement floor, a cement patio just back of that, then of the lawn and the cliff rising upward from it. It is the natural growth on the 60-foot high cliff that gives Mr. and Mrs. Garcia the most pleasure. In spring there are redbuds blooming against the bare branches of oaks, elms, wild chinaberries, and bois d'arcs. In the summer, there is the soft, cool green of dense foliage. The autumn color of swamp holly, sumacs, and oaks makes an unforgettable glow. Even in winter, the cliff is beautiful, especially when snow softens its contour. That, agree the Garcias, probably is their favorite of all the views from their picture window. A birdbath is in the back yard. Wild sarsaparilla vines climb the fence at one side. Walls and furnishings indoors bring outside in. Mrs. Garcia chose chartreuse for her walls, not only because it was her favorite shade, but also because it complemented the dark green and red upholstery of the contemporary furniture. Pot plants are on tables both inside and outside the large window. A lovely contrast is the lovely wide red brick fireplace, with tile American and Spanish coats of arms, and the dark china closet containing the chartreuse china. Strings of peppers hang on the redwood wall of the porch. Sage grows with gardenias and pyracantha just back of the house. A tall lamppost holds a dark metal lamp near the patio where the forthcoming barbecue pit will be. There is a pecan tree at the back. It has nuts but the Garcias rarely get one. The squirrels, of which there are many in th woods, always beat them to them. Later on a friend will help Mrs. Garcia put in a lily pool. "With privacy and a lovely view already achieved, we can take our time getting all the other projects finished," she said. She might have added "restfulness" to the view and privacy for that is exactly what one feels on entering the grounds. [In the photo,] Mrs. Henry Garcia is enjoying both the beauty and quiet of a tree-covered 60-foot high cliff just back of a modern city home. She and Mr. Garcia planned it this way when they built on a strip of woods at 226 South Shore Drive and set a large picture window in their back living room wall. (©Dallas Morning News, December 16, 1951, Section III, Page 21). By Ruby Clayton McKee, Society and Club Editor of The News - “Mr. 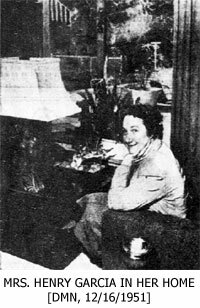 and Mrs. J. Stuart Todd made their first trip to Texas nine years ago and stayed. The young architect had just been graduated at the University of Michigan and was eager to start his career. Dallas promised possibilities and a job. After a few days of nostalgia for their native city of Ionia, Mich., the Todd’s adopted their new state. They accepted, not only the warm hospitality extended them, but also the opportunities for service in their newly found community. They became identified with civic drives, club, and church work. The attractive mother is the new president of the Junior Oak Cliff Society of Fine Arts, a group of 130 civic-minded young women. 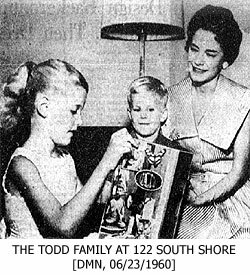 Mr. And Mrs. Todd, their daughter Tamara who will be seven in August, and their son Duncan, five years old, make their home at 122 South Shore Drive. Mrs. Todd is one writer who does not aspire to write the great American novel. The Michigan State University graduate likes news reporting and worked on Michigan papers. While pursuing her journalism courses at the university she became versatile in another field - she played snare drums for the university band. Mrs. Todd also has taken violin lessons and currently sings in the choir at the First Unitarian Church to which she belongs. She and her husband are members of the board of directors of the Dallas Museum for Contemporary Arts and collect modern art for their home.